And in this position he immediately felt himself so pleasurably supported and so deeply soothed that he remained as he was, without reading, completely absorbed into Nature, in a nearly unconscious contemplation. (…) it was as if almost unnoticeable pulsations were passing into him from the inside of the tree; he explained this to himself quite easily by supposing than an otherwise invisible wind, perhaps blowing down the slope to the ground, was making itself felt in the wood, though he had to acknowledge that the trunk seemed too thick to be moved so forcibly by such a mild breeze. What concerned him, however, was not to pass any kind of judgment; rather, he was more and more surprised, indeed astonished, by the effect of this pulsation which kept ceaselessly passing over into him; it seemed to him that he had never been filled by more delicate movements; his body was being treated, so to speak, like a soul, and made capable of absorbing a degree of influence which, in the usual distinctness of physical conditions, wouldn’t really have been sensed at all. (…) Nevertheless, concerned as he always was to account for precisely the subtlest impressions, he asked himself insistently what was happening to him, and almost immediately found an expression that satisfied him as he said it aloud: he had passed over to the other side of Nature. As happens sometimes in a dream, this phrase now gave him joy, and he considered it almost completely apt. The year 1913 and its margins represent, as Piotr Szarota’s recently published, fascinating book on Vienna in the period has shown, a unique juncture in European history, and, more specifically, the crest of the wave of modernist cultural transformations. Rilke’s intimate observation may be recognized as no less significant in defining the then-receding generation and the literature of the post-World War I era than Hugo von Hofmannsthal’s “The Letter of Lord Chandos,” singled out by Richard Sheppard as “encapsulat[ing] the crisis of modernism as a whole,” summarizing modern man’s drive “to rethink his understanding of reality, himself, and his relationship with reality” – especially in the context of an attempt at a scholarly description and assessment of Leonard Lisi’s book Marginal Modernity. The Aesthetics of Dependency from Kierkegaard to Joyce. Both Rilke and Hofmannsthal are important figures in the book. And though Lisi writes mainly about the Duino Elegies and Malte Laurids Brigge in the book’s final essay, without even so much as mentioning “An Experience,” that work may serve as a splendid introduction to the exercise in cartographical revision that Lisi aims to perform on the map of European modernism. The experience in the title of Rilke’s work is not so much an epiphany itself, as the ability to tell about it, a satisfaction with the words that manage to grasp the essence of the matter. This stands in contradiction to the central experience of modernism, which is the effort to deal with the situation of existential and communicative anxiety resulting from the crisis of naming things and phenomena described by Hofmannsthal in “The Letter.” Lisi, in interpreting the latter work, unequivocally opposes the emphasis (placed by, among others, Sheppard) on the part devoted to the inadequacy of operative semiotic codes, drawing readers’ attention instead to the closing sections of the work, in which a hope is expressed for the possibility of learning a language, of which the author of the titular letter knows not yet a word, but one “used by the dumbest of things in speaking with [him]” and in which “perhaps, [he] will someday be called to account for [himself] from [his grave] before an unknown judge.” A positive alternative to the critique of modernity contained in the Hofmannsthal text discussed by Lisi [MM 219] is also found in Rilke’s text and in the other texts interpreted in Lisi’s book, by Ibsen, Henry James, and Joyce. 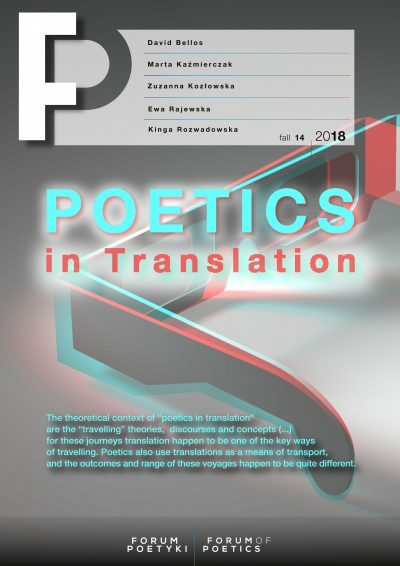 The protagonist of “An Experience,” having encountered the “other side of nature” and able to tell about it is a poet who affirms the possibility of transcendence and simultaneously of expression. These possibilities are connected with relinquishing the logical categories of what is known and defined by rational thought and the willingness to embrace what is non-human, that with which man appears to communicate in his dreams. Lisi’s own “aesthetics of dependency,” proposed as a rival contender with these two most popular models, is drawn from the “margins” of European Modernism to which the title of his book also refers. Lisi looks to the philosophy of Kierkegaard and the oeuvre of Ibsen for the sources of a new artistic practice, within which we find organized typically Modernist “technical devices (anti-mimesis, semiotic ambiguity, fragmentation, etc. )” as well as “conceptual and thematic preoccupations (epistemological skepticism, crisis of modernity, relativity of values, subjectivity, modern urbanization, politics, etc. )” [MM 6]. That list of concepts demonstrates the cohesion between the experience recorded in the texts of Kierkegaard and Ibsen, on the one hand, and other modernist works, on the other, enabling Lisi to state in aesthetic terms the distinct quality of the modernist quest in its Scandinavian version. Lisi finds that “the cultural setting of Scandinavia provided a particularly apt context for the development and dissemination of this aesthetic form” [MM 271]. The exhaustion of the idealist paradigm that, linked by Johan Ludvig Heiberg with a particular political and social structure, became the object of criticism from Scandinavian authors in the late 1860s and early 1870s (as Lisi shows when he interprets Ibsen’s Peer Gynt and cites the importance of Georg Brandes’s printed lectures), which in turn created the field for a new way of mediating and organizing the artistic reaction to the experience of the modern world. They turned out, in Lisi’s view, to be so attractive that the authors whom he considers the central figures of modernist discourse gravitated toward their use. Adroitly maneuvring between the modernist ambition toward unity and totality in a work and the crisis of that dream shown by the particularism of early twentieth century avant-garde currents, Lisi proclaims himself in favor of the artistic dream of fulfillment, the ambition of so many writers mentioned in his book; together with Kierkegaard, the scholar seeks formulas for a dynamic relationship that would give the fullest expression to the specific substance of idealism and rescue the belief in a transcendent order of things that endows life with meaning – even if it is to be merely an order of aesthetic things (and furthermore, an entirely new order). Two earlier works that underscored the importance of Scandinavian authors and their works for the development of modernism are significant touchstones for Lisi: Toril Moi’s Henrik Ibsen and the Birth of Modernism, published in 2006, and Arnold Weinstein’s Northern Arts, released two years later. The former volume in particular is crucial, from Lisi’s perspective, because its author “seeks to rethink the nature of Modernist aesthetics more generally” [MM 10] through her analysis of Ibsen’s oeuvre. Moi, whose book brought Ibsen’s work back into the modernist canon, proposes a program which clashes with Lisi’s interpretation, though he has not clearly stated the fact. What the author of Marginal Modernity calls “aspects of idealist aesthetics […] very different from those studied here,” emphasized in Moi’s reading of Ibsen [MM 10-11], in fact represent a completely distinct vision of the reception of Ibsen’s work. Moi’s highly provocative study lifts the bar for all subsequent attempts to examine Scandinavian modernism, inasmuch as her ambition is not to build an entirely new model of modernist aesthetics (as Lisi wishes to do). Moi’s work confines itself to advancing Ibsen into a slightly reformed modernist canon, in accordance with most of the principles that constitute that canon. Her project involves revealing Modernism to be an attempt at a rupture not so much with Romanticism (a claim she finds easily falsifiable), but with idealism (in both its Romantic and moralistic meanings). Moi is skeptical towards the argument made by Frode Helland, in her view a typical spokesperson for Jamesonian reconstruction of the “ideology of modernism,” claiming that Ibsen believed in the autonomy of the work of art in an orthodox modernist sense and inclined to believe Ibsen when he downplays the affinity between his works and Kierkegaard’s thought. Ibsen, in defending his intellectual and artistic independence, can in fact function as the hero in both of these literary-historical narratives. Moi and Lisi are both equally qualified to expand the horizon of nineteenth-century Europe in a northerly direction, and the reader need not choose a single path, though he must be aware of which Ibsen to choose. For alongside the old, rejected Ibsen whom both scholars seek to recontextualize within modernism, their analyses also open our eyes to different versions of his oeuvre, though these are not necessarily mutually exclusive. Those readers who choose Moi’s Ibsen will no doubt have an easier time reconciling him with the program of modernist rebellion of the fin de siècle in the 1890s, thereby also fortifying the nineteenth century’s beachheads of modernity; those who follow Lisi’s tracks will get a chance to discover new interpretative perspectives by tracing the reception of Kierkegaard, Brandes, and Ibsen, and to begin reconstructing the literature of that time in terms of its Northern inspirations (when it comes to Poland, we do so in defiance of Przybyszewski, who swore that he had taken nothing from the Scandinavians). I once saw a production of The Wild Duck that took place in a ballroom where the chairs were distributed in two rows along the walls. I was seated in the front row, so close that I could easily have touched the actors. After the intermission, the actor playing Gregers Werle came on stage with a long white thread stuck to the back of his dark jacket. The thread was distracting, and the temptation to stretch out my hand and take it off was immense. Yet I didn’t. I simply could not do it, and the thread stayed where it was. Moi’s interpretation of Emperor and Galilean depends on upholding barriers between audience and actors, to the same extent that Lisi’s reading of A Doll House, is dependent on breaking the fourth wall and revealing the moment in which the spectator becomes equally a chosen character in the world of the play. Moi tells of modernist diagnoses present in what she finds to be Ibsen’s key work; he attempts to reconstruct Ibsen’s plays by redefining the ontological status of the characters and the audience. Lisi starts with the controversial ending of A Doll House, which already in Ibsen’s time led to Arthur Jones’s 1884 restaging and Henry Herman’s Breaking a Butterfly with the ending changed. Lisi argues persuasively that the impulse to change the plot results from a lack of motivation (in the context of social relations among members of the nineteenth-century bourgeoisie) for Nora’s dramatic decision. That decision is, rather, justified at other levels of the text. By suggesting the metatheatrical effect of this ending, in which the inadequacy of representative models of the “well-made play” and back-story as characters’ motivation is revealed, Lisi suggests that those are imperfect formulas because they are unable to capture what Nora becomes at the end, the new measure of humanity, which in this new perspective becomes precisely that need expressed in the line “I must try to become a human being.” The Kierkegaardian expression and the drive toward transcendence that Lisi here invokes impressively punctuate his reflections on the meaning of “the most wonderful thing,” the words spoken by Nora in the first act to define Torvald’s promotion, in the second act express her opposition to her husband’s potential sacrifice on her behalf, before finally becoming Torvald’s eloquent, bitter reaction faced with the emptiness left by Nora’s departure. The combination of wonder and otherness for Lisi justifies using the word “magical”; it does not entirely cohere with Kierkegaard’s concept of the indescribable, but splendidly indicates the substance of the transformation that Ibsen is supposed to lead toward as a pioneer of the aesthetics of dependency. Those among the spectators or readers of the drama who join Lisi in judging that they know enough to join in the life of the play’s characters, will be astonished (and enraptured) to observe the birth of a new (aesthetic) order of things, in which Nora’s decision is no longer absurd. The concept of magic, invoked by Lisi in order to end part one of his study on a spectacular note, allows us to have a little fun by taking him at his word. The transformation Lisi describes in his analysis of the final scene of A Doll’s House involves nothing other than the reading method that he proposes to apply to important works of Modernism in part two: James’s Wings of a Dove, von Hofmannsthal’s “Letter,” Joyce’s “The Dead,” and Rilke’s Notebooks of Malte Laurids Brigg. The essence of these readings consists of discovering two semiotic orders within the work that finally become harmonized by means of an attempt to look at events and the manner of their presentation from the outside, free of the limitations to which the characters find themselves condemned (as well as readers who trustingly follow familiar conventions and are ill-prepared to cope when the action develops differently from the formulas they know from previous texts). It would be difficult to defend the thesis that Søren Kierkegaard drew up the program for European modernism. There is no doubt, however, that his perception of the relationship between the human being and the absolute gnawed at the European consciousness of that era and combined with the Romantic sensibility of awe before the Other could have inspired and did inspire people to search for meaning outside the work itself. Lisi’s goal of showing the connections between the modernists who figure in his book and Kierkegaard’s writings by documenting the reception of those works may be read, we conclude, less as an instance of scholarly rigor than as an effort to stem the flow of interpretative freedom that, based on a belief in interpretative possibilities concealed within a work that vary from the authorial intention, de facto allows any meaning whatsoever to be freely conferred upon the work. Lisi wants the current of modernist aesthetics he is reconstructing to retain the memory of its source and he attempts this even when he finds little direct evidence of reception (as in the case of Hofmannsthal), or when, unable to document Kierkegaard’s influence, he emphasizes writers’ fascination with Ibsen (in the cases of James and Joyce); the Scandinavian periphery expand through this desire to designate observed influence in this area crucial to Modernism, which may well result in whetting scholars’ appetites to explore other provinces in modern literature’s kingdom and redefining their importance in the annals of literary history. Reversing previous vectors of influence (which Lisi is engaged in when he polemicizes with the theses put forth in Pascal Casanova’s book The World Republic of Letters) and demonstrating the falsity of the assumption that only the mighty center can exert influence on the periphery and that reverse processes are unheard-of and impossible, renders the map of modernist Europe suddenly much more intriguing (at least potentially) than it was before. Lisi in Marginal Modernisty seeks out examples of this reverse direction of influence (for instance, in his consideration of the significance of James’s criticism in the discussion of the “scandalous” early twentieth-century London productions of Ibsen, or in his analysis of the Scandinavian heritage’s penetration of Rilke’s work). In decisively demonstrating the threads of Kierkegaard and Ibsen’s reception, Lisi is not proving the reception of an aesthetic model developed on the strength of a structure of identity; he is, however, showing its undoubted incompatibility with leading modernist thought currents about non-human perspectives on human struggles with the existing world. That means that the experience of transformation that Kate decrees at the end of The Wings of a Dove, the hope for a new language expressed by Hofmannsthal’s Chandos letter, or Gabriel’s thoughts as he looks at the falling snow in The Dead, underpinned by Kierkegaard’s metaphysical exploration or the techniques for unmasking nineteenth-century social dysfunction that we find in Ibsen’s dramas, complete our understanding of the multi-layered nature of Modernism, whose consistent ambition is to move outside the structures of circumstance and the breathless longing to be something more than creatures defined by contemporary social attitudes. From the Polish perspective, such an attempt to magnify our vision of European culture by examining the Scandinavian contribution sets a powerful precedent. It allows us to think a bit more ambitiously about the European significance of Polish works of the 1880s and ‘90s and also those from the dawn of the twentieth century; it forces us to consider what aesthetic models have germinated in Poland’s finally no less specific cultural climate, as well as whether and by what avenues they may have reached the cultural centers of modernism. A gentle something separated him from his fellows by a pure, almost apparent, intermediate space, through which it was possible to pass single items but which absorbed any relationship into itself—and, being saturated with it, intervened like a dark, deceptive vapour between himself and others. He did not know yet to what extent his separation was sensed by others. As far as he was concerned, it gave to him, for the first time, a certain freedom towards men […], a peculiar ease of movement amongst these others, whose hopes were set on one another, who were bound together in death and life. The aesthetics of dependency does not heal the individual’s relationship with society, nor indeed, in light of this passage, should it. Expanding the spectrum of aesthetic reactions within the modernist corpus, Lisi follows his protagonists in allowing us to perceive what Rilke also noticed about isolation – the potential to discover the meaning accessible to an individual who transgresses barriers of accepted convention (social, communicative, philosophical) and activates new areas of self-exploration. Although, as Kierkegaard wrote in his diary: “[i]t is dangerous to cut oneself off too much, withdraw from the bonds of society,” the peculiar aspect of modernity (in its Scandinavian as in every other regional iteration) enables us to see that the permissible degree of separation is a value open to negotiation; useful and desirable at those moments when in rare communion with nature, with a book under his or her arm, one tries to find the source of that strange trepidation that rises in the trunk of the tree of knowledge that grows in solitude. Lisi’s book, in many places challenging to the existing order of things and in some places inspiring in its blasphemy, presents an important lesson in the historical method, too often ignored in recent times, of textual interpretation and cross-sectional thought. Lisi introduces a theoretical model from texts written over a century ago and thereby reminds us that modification of petrified concepts of historical transformation spells hope for catching a glimpse of important and previously ignored elements within wholes we know only superficially. 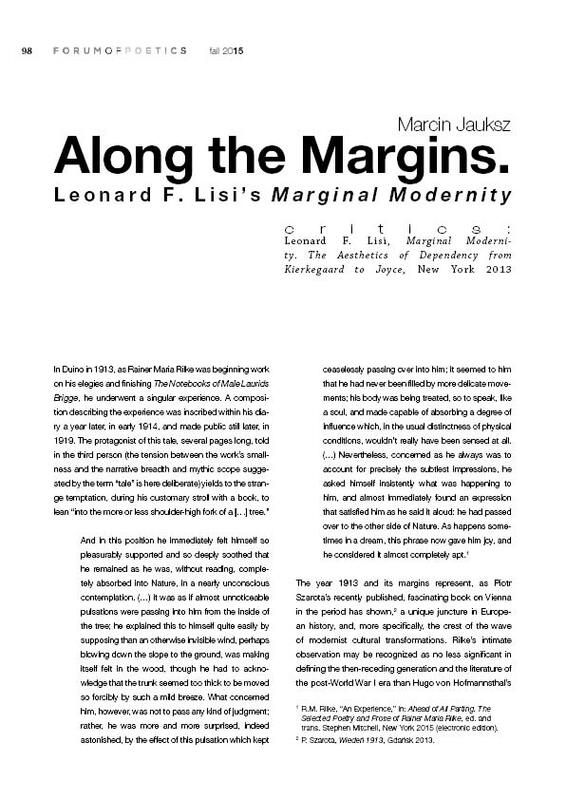 The topic of this review, Leonard F. Lisi’s book Marginal Modernity. The Aesthetics of Dependency from Kierkegaard to Joyce, is an ambitious attempt to reconstruct the cartography practiced by scholars of European modernism. Examining the northern periphery of the continent, Lisi tries to show how an aesthetics of dependency, formulated within the philosophy of Søren Kierkegaard, was disseminated in Western literature, chiefly through the reception of Henrik Ibsen’s plays, influencing the perception of art, humanity, and our place in the world in the works of such artists as Henry James, Hugo von Hofmannsthal, and Rainer Maria Rilke. R.M. Rilke, “An Experience,” in: Ahead of All Parting. The Selected Poetry and Prose of Rainer Maria Rilke, ed. and trans. Stephen Mitchell, New York 2015 (electronic edition). P. Szarota, Wiedeń 1913, Gdańsk 2013. R. Sheppard, Modernism – Dada – Postmodernism, Evanston 2000, 99. L.F. Lisi, Marginal Modernity. The Aesthetics of Dependency from Kierkegaard to Joyce, New York 2013, p. 6. Further quotations from this volume refer to it by the abbreviation “MM,” followed by the page number, in brackets. Modernism, when capitalized by Lisi, refers to the entire period from the mid-19th century until after the Second World War. He distinguishes this from modernism written lower-case, by which he means the literary current marked by certain artistic features. These features distinguish modernism from realism and bring it closer to the avant-garde. What distinguishes modernism from the avant-garde are certain principles concerning the structure of the artistic text which modernism shares to some extent with realism (the organic structure of the work of art). See MM, pp. 4-6. The Sickness unto Death: A Christian Psychological Exposition for Upbuilding and Awakening, in Kierkegaard’s Writings, ed. and trans. by H.V. Hong and E.H. Hong, Princeton, NJ 1980, 19, 13. Quoted in Lisi, MM, p. 42. Lisi designates this quotation as having been slightly modified by himself. M. Berman, All That Is Solid Melts Into Air. The Experience of Modernity, New York 1988, p. 22. T. Moi, Henrik Ibsen and the Birth of Modernism. Art, Theater, Philosophy, Oxford 2006. The first chapter has been translated into Polish by M. Borowski and M. Sugiera as “Ibsen i ideologia modernizmu” (Ibsen and the Ideology of Modernism), published in: Ibsen. Odejścia i powroty (Ibsen. Departures and Returns), ed. M. Borowski, M. Sugiera, Kraków 2009, pp. 25-52. T. Moi, Henrik Ibsen and the Birth of Modernism, pp. 206-207. See MM pp. 135, 136. R.M. Rilke, Where Silence Reigns, trans. G. Craig Houston, New York 1978, p. 36. S. Kierkegaard, Papers and Journals: A Selection, ed. and trans. A. Hannay, New York: 1996, p. 52.